Today I bring out my art journal, an old friend who needed some attention. I’ve started a thousand journals in my lifetime. When I was young, I called them diaries. I had many. The ones with locks were the most coveted. I would write feverishly in a new diary for the first six to eight pages. After that, blank pages abound! Turns out, I didn’t like writing down my thoughts. (And just so we are clear, these were not deep thoughts. I mostly wrote about my outfits and my gnome collection.) It wasn’t until art school that I realized that I didn’t have to write. I could draw! And so began my art journals. I have saved many of my journals over the years. Quite honestly, my most recent journal needed to be dusted off for this post. My last entry was a drawing of a TV cabinet I wanted someone to make for me for my old house, which was four years ago. (Sometimes, good habits fall by the wayside, especially when you have a house full of teens and tweens. Ironically, I buy them lots of journals, which remain empty except for the first few pages. Maybe it’s hereditary.) I flipped back through my old journal and found some sketches and ideas I had for a children’s book, which I had completely forgotten about. I can’t tell you how incredibly satisfying it is to see my creative thoughts from years ago, and to start working in my journal again. 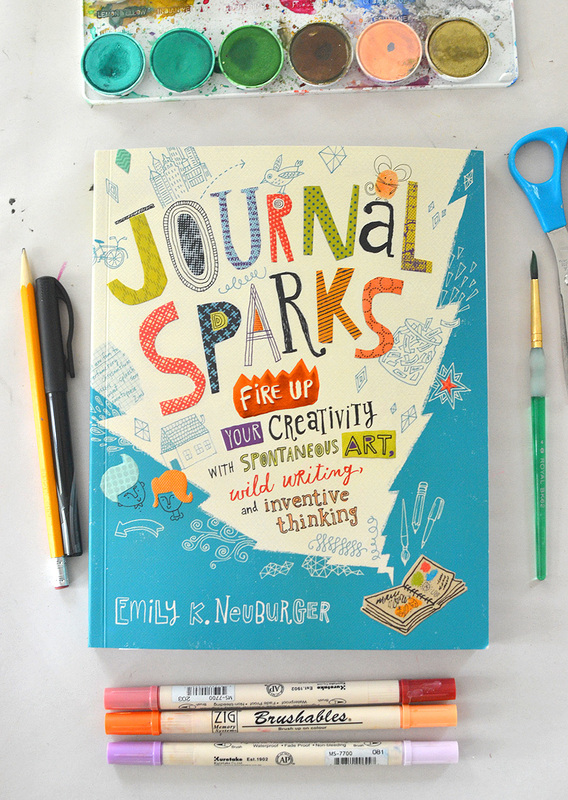 I want to share with you my favorite journals and best supplies to get started, but first I have to tell you about this new book from my friend, Emily Neuburger. It’s called Journal Sparks, and it’s spectacular. Just look at that cover!! I love all the fonts and doodles and colors and layout. If I were to judge this book by it’s cover, it would be in my shopping cart even if I didn’t know the author. Disclosure: This book was sent to me as a gift. I did not have to review it, (there have been plenty of books that I have been sent that I have not reviewed), but I did so because I love it and I think it will inspire you! All of the words and sentiments are my own. The name, Journal Sparks, couldn’t be more perfect because this book really does light a S P A R K in your brain and inspires you to shut down all devices, turn on some music, and simply put pen to paper. 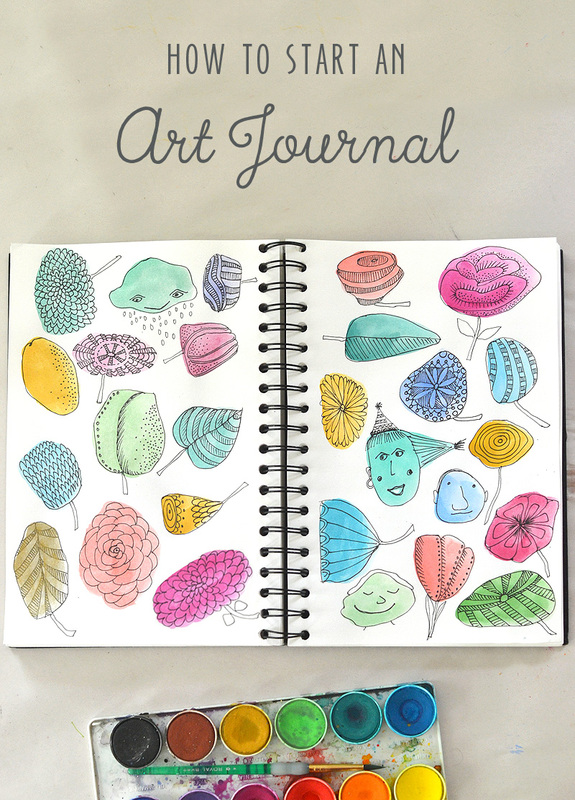 It is filled with 60 art prompts, guided exercises, and crafty activities that will help you jumpstart your new journal. 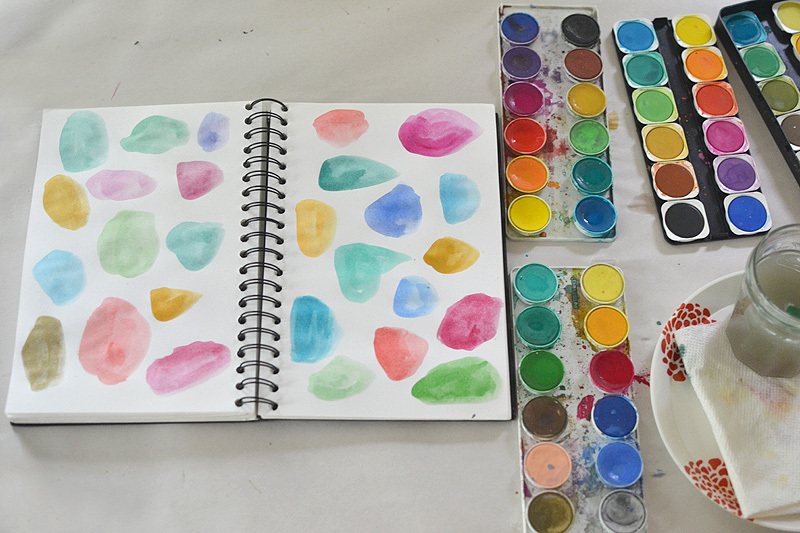 From drawing and painting, to mapping and collage, there are so many good ideas inside. Along with the prompts there are also some insightful interviews with accomplished journal keepers and examples of their journals and how they keep their creative juices flowing. I have SO many favorites prompt from Emily’s book. I turned down about fifteen corners just to start with. Let me show you a few of my immediate faves. 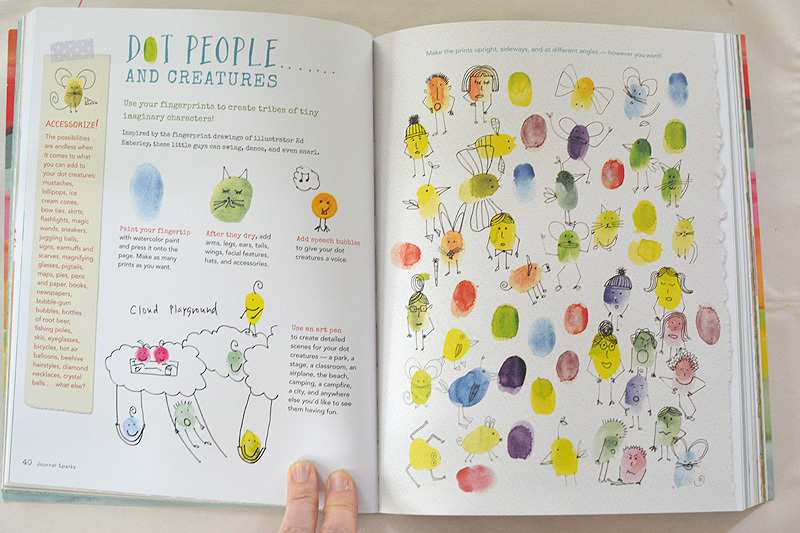 DOT PEOPLE :: I am going to do this with my art campers. They will love using their fingers. I want to set up a whole journaling station where there is a prompt of the day. I’m so excited! 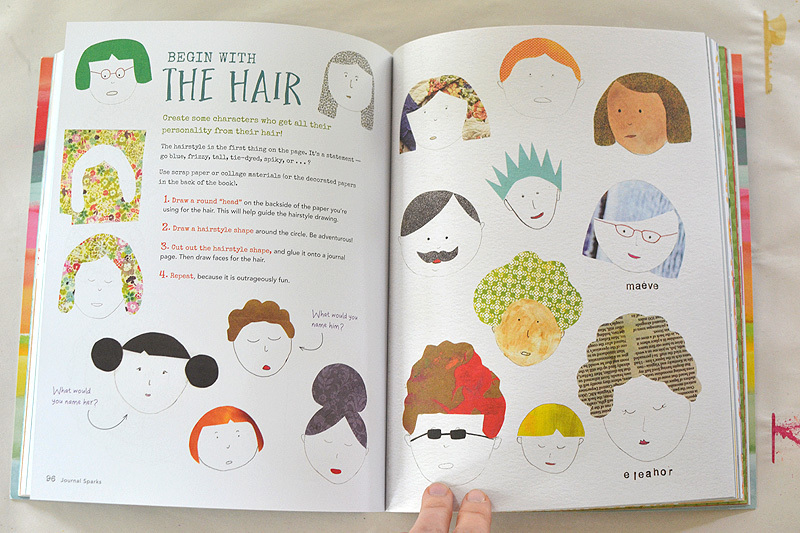 BEGIN WITH THE HAIR :: I mean, this is too cute, I can’t even stand it. A good way to practice faces, too. Faces are hard for me but the more I do them the more comfortable I get. 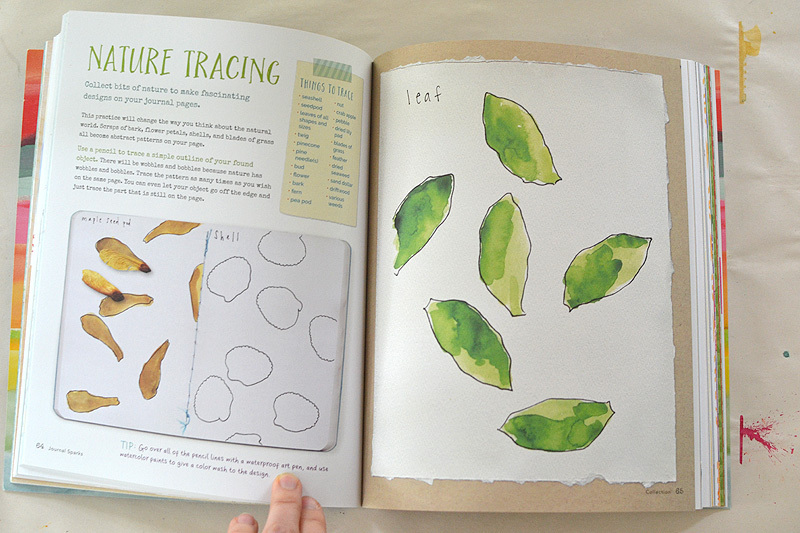 NATURE TRACING :: It’s the simple prompts that I think are so genius. This one will be wonderful in the fall with all of those beautiful Connecticut leaves. I can see this being done with seashells, too. 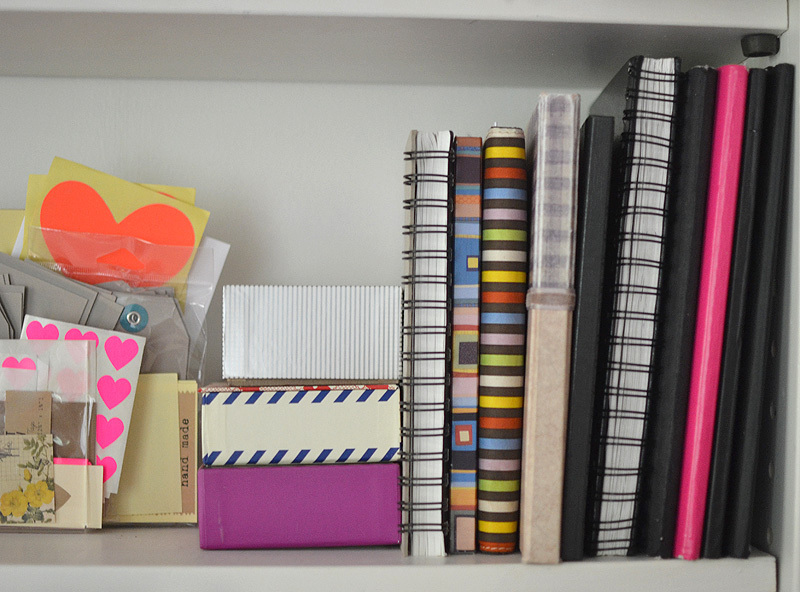 ~ Get your supplies organized in one place. 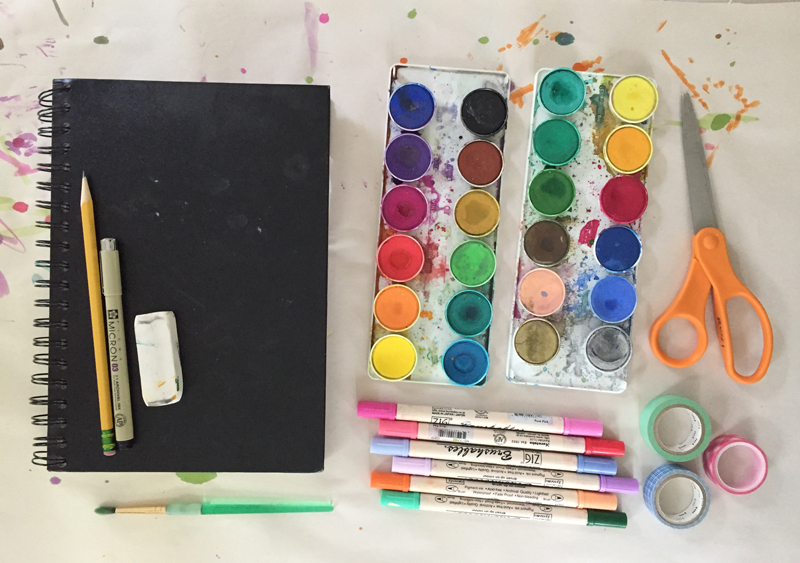 I love the art cart in my art room, but you can also just use a big tray to gather all of your supplies in one place. ~ Find a table or desk where you can work and leave your supplies out and available. Maybe bring a small table to your room, or set it up in a room where there isn’t a lot of traffic, but where you feel inspired (don’t use a basement as natural light is key for inspiration). ~ Open Journal Sparks, pick a prompt, and begin! It’s that easy. 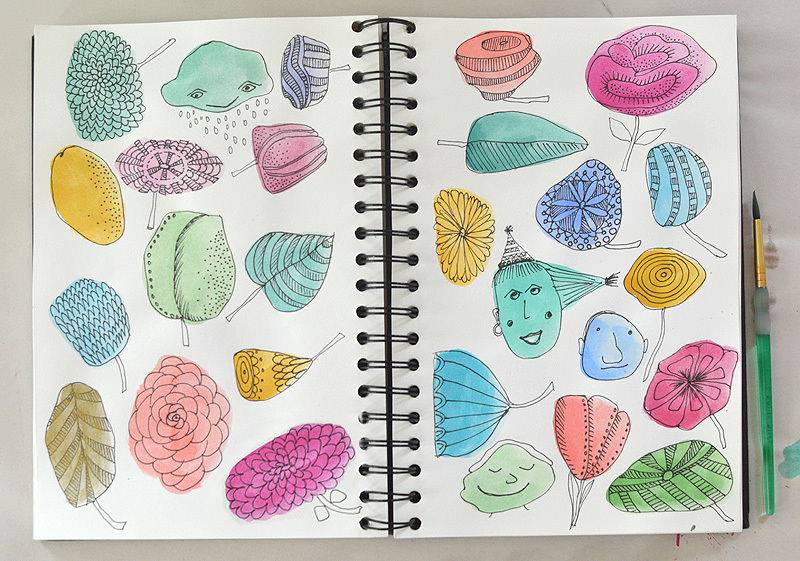 ~ Alisa Burke is the guru of art journaling, and she wrote a brilliant post about sketching on the go. Getting outside is a wonderful way to get inspired. ~ One last thing, don’t work to be perfect. Just work. The whole point is to open yourself up and find your imagination. It’s about self expression, not perfection. This is my journal. I chose to start with the prompt blobs. I was so nervous to do this and very hesitant at the beginning. But as I kept going, I got faster and more confident. I basically looked at the shape and tried to envision in my mind what it could be. I think I love the cloud guy the best. Here is a video of me in action! It actually took me about 45 minutes from start to finish, but I condensed it to a minute and a half. I hope you feel inspired to get offline, put down all your devices that flash news stories at you, and get started with your art journal. Beginning this habit will forever change the way you see the world. I would like to personally congratulate you as your blog Art Bar has been selected by our panelist as one of the Top 100 Kids Activities Blogs on the web.